At Shade Hotel, we strive to make sure each and every one of our guests has an extravagant experience. Our professional staff goes above and beyond to care for the needs of our guests, and whether you're visiting us for a weekend getaway or celebrating one of life's most important milestones at our beach wedding venue, we'll do everything possible to ensure your stay exceeds your expectations. 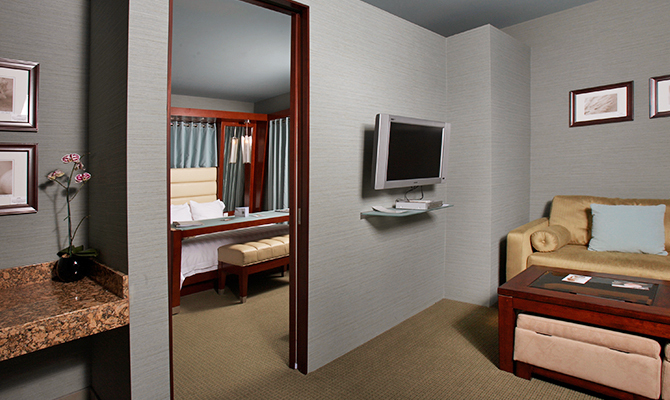 Give yourself the gift of an experience you'll never forget: book your stay today. Our signature rooms. Soft greens and blues and rich, exotic woods create a tranquil environment. Each of these rooms offers our California King size Tempur-Pedic™ bed, exclusive multifunctional rolling desk, balcony with seating for two and an endless array of extra features: Keurig™ coffee machine for a wide range of freshly brewed hot beverages, top of the line bath products to enjoy in your shoji screened 2-person Sanijet™ spa tub with color therapy or soothing shower. Deluxe Spa Rooms area available with an additional daybed on the first floor or feature a Heat & Glo™ Cyclone Fireplace on the second floor. Deluxe Spa Rooms area available with an additional daybed on the first floor. Our signature rooms. Soft greens and blues and rich, exotic woods create a tranquil environment. All rooms offer our California King size Tempur-Pedic™ bed, exclusive multifunctional rolling desk, balcony with seating for two and an endless array of extra features: Keurig™ coffee machine for a wide range of freshly brewed hot beverages, top of the line bath products to enjoy in your shoji screened 2-person Sanijet™ spa tub with color therapy or soothing shower. 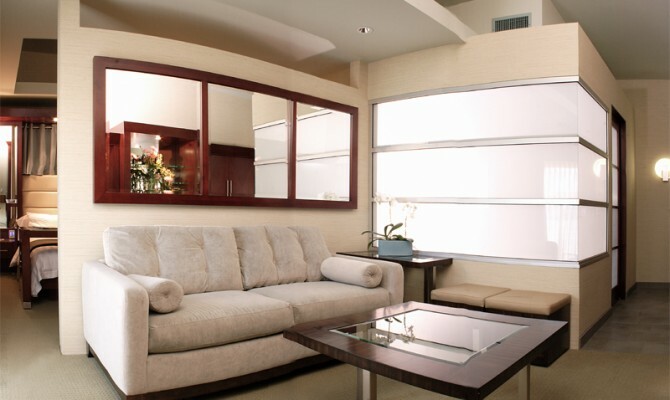 These accessible rooms also feature roll-in showers, ADA-compliant closet spaces, bathrooms with compliant grab bars and clearances in addition to all guestroom features and amenities at compliant heights and clearances per ADA regulations. TTY available upon request. Accessible Deluxe Spa Rooms either have an additional daybed on the first floor or feature a Heat & Glo™ Cyclone Fireplace on the second floor based on availability. Situated on the second floor and available either individually or as a combined unit with the Penthouse, this Luxury Suite represents one of our most exclusive and luxurious accommodations. 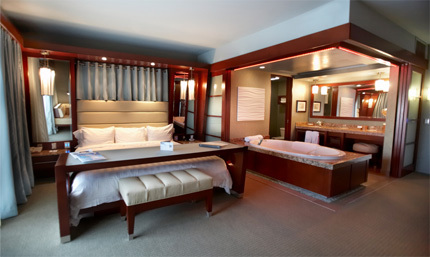 This suite has an exceptionally large bathroom with sit or stand Mr. Steam™ steam shower, 42″ plasma television and a West facing balcony to breathe in the ocean air. Soft yellows and rich, exotic woods create a tranquil environment. This room offers a California King Size Tempur-Pedic™ bed, a couch that opens to Queen Size bed for extra guests, and an endless array of extra features: Keurig™ coffee machine for a wide range of freshly brewed hot beverages, top of the line bath products to enjoy in your shoji screened 2-person Sanijet™ spa tub with color therapy. The Napa Suite offers two complimentary bottles of California red wine, dual powder areas and a living area with Flex Steel™ sofa chairs and coffee table—perfect for a relaxing weekend—or for a pampering retreat any old time. It's perfect for families looking for a getaway, couples planning their beach wedding, or any other traveler in search of true luxury. Situated on the second floor and available either individually or as a combined unit with the Napa Suite, the Penthouse represents one of our most exclusive and luxurious accommodations. This Luxury Suite has an exceptionally large bathroom with sit or stand Mr. Steam™ steam shower, large flat screen TVs and a West facing balcony to breathe in the ocean air. Dark grays and rich, exotic woods create a soothing environment. This room offers a California King Size Tempur-Pedic™ bed, a couch that opens to Queen Size bed for extra guests, and an endless array of extra features: Espresso machine for a wide range of freshly brewed hot beverages, cocktail shaker for your personal sundowner, top of the line bath products to enjoy in your shoji screened 2-person Sanijet™ spa tub with color therapy. 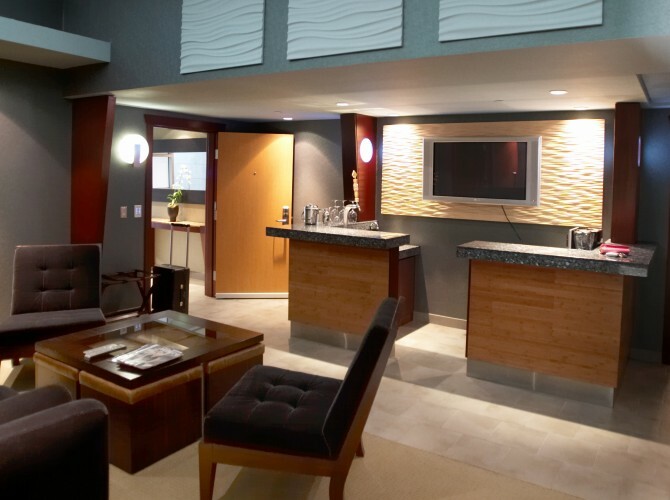 The Penthouse Suite has a living area with sofa chairs and coffee table, unique private entertaining bar including beer on tap by request, and large flat screen TVs in the living room for the ultimate party. Whether you're tying the knot at our Los Angeles beach wedding venue or simply looking for a luxurious hideout, our Penthouse Suite can't be beat. Need to get comfortable? Staying a while? Equipped with a bedroom and separate dining/living room with dining table, this second floor Luxury Suite has a built in desk area and expanded wet bar with sink, refrigerator and microwave for both that unexpected meeting and the need to entertain. 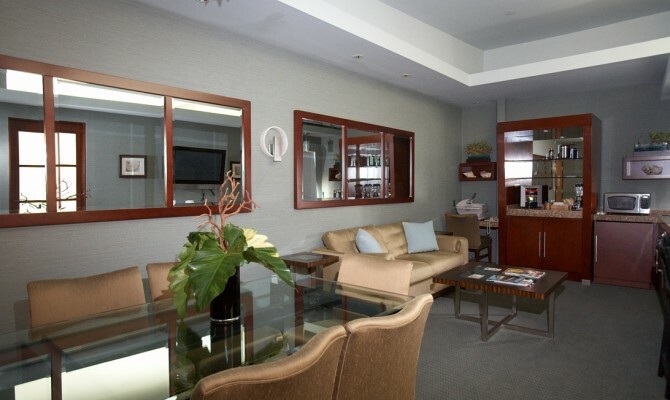 Equipped as your own private office complete with board room style table. Ideal for the extended stay business executive, this room also offers the largest balcony in the house overlooking the Metlox Plaza and its unique Kiln Fire Sculpture. Explore the trendy Manhattan Beach restaurant scene during your stay at Shade. 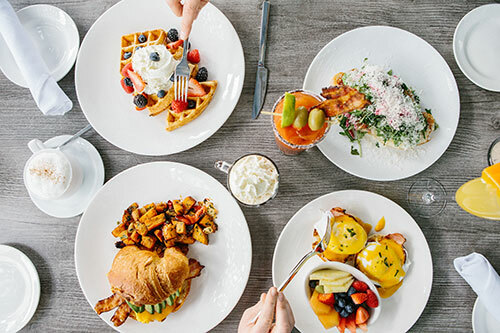 Our Foodie Package package includes two $50 gift certificates for use at Rock'n Fish, The Strand House, or zinc@shade, all of which are just a short walk away! You’ll also be treated to a special culinary gift upon arrival. For those who want to be immersed in romance, the Kiss & Tell Package offers an unforgettable experience. You'll be welcomed by lush rose petals sprinkled throughout the room on arrival, and you'll also get to enjoy our complimentary sparkling wine, chocolate-covered strawberries, cake pop turndown service, and one “Keep It Interesting” item will await you in your room at check in. Whether you're planning your hotel wedding, celebrating an anniversary, or just looking to get away for awhile, you and your special someone are sure to enjoy a new level of romance. Available all year long, blackout dates apply. Relax a little longer. 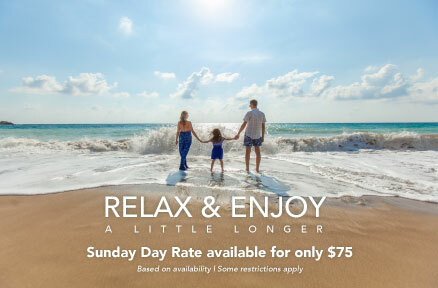 Stay through Sunday and check out by 6PM for only $75. Subject to availabilty and not available on holiday weekends. Give yourself the gift of luxury and experience what true excellence feels like. Whether you're planning a quick trip, need a comfortable and efficient home base for extended business travel, or you're making plans for the beach wedding of your dreams, Shade Hotel is dedicated to ensuring everything goes off without a hitch. So what are you waiting for? Contact us today!